a few months. We did have a very nasty day on this past Sunday with rain and wind all day and chilly temperatures too. We were invited to watch the MSU basketball game (our first loss in the Big Ten - so sad) at a friend's house and when she said she was making chicken chili, which sounded so good on a cold day, I offered to bring these delicious corn muffins. They are definitely not low calorie, but by adding all kinds of fun ingredients, they are not your mother's dry corn muffins either. This recipe makes a pretty big batch (around 20), but I just froze the extra and they will be great to pull out from time to time. 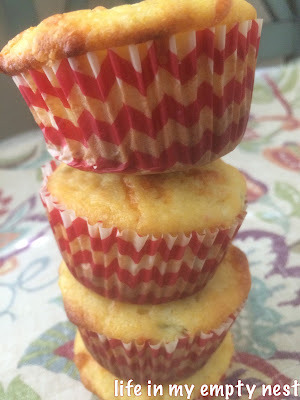 I always use Jiffy Corn Muffin mix, because they are a local, Michigan based company and are a memory from my childhood. But, any brand mix will do. It's the other good stuff that really makes this recipe special. Enjoy! Preheat oven to 375 degrees. Place muffin cups in 12 serving muffin tin. Beat eggs and oil until well combined in a large mixing bowl. Add creamed corn, frozen corn, sour cream, cheese and diced green chilies. Mix and stir just until moistened. Batter will appear lumpy. Put batter in prepared baking cups with an ice cream scoop, filling almost full. Bake for 20-25 minutes until just starting to brown on the top. Remove from muffin tin and cool on rack. Bake second batch as needed. Store leftovers in refrigerator. Oh, those look good! Just visited Jiffy and got free muffin mix! Gotta love the place -- and it does make for good muffs! These look tasty! I am always looking for something to go along with a soup or stew. It's still crock pot weather here in Vancouver! They are a perfect accompianment to soup! P.S. I am unable to reply via email for some reason, so I hope you see this.